Students in Massachusetts are doing great while their peers in Alabama and D.C. are languishing. It's so common to see studies about the United States's lackluster academic performance compared to other countries, it's barely newsworthy anymore. The American education system, the story goes, is mediocre. A new report from the National Center for Educational Statistics complicates that picture a bit. It attempts to rank how individual states compare internationally, and shows a wide gap between the highest-performing states and the lowest: Massachusetts does quite well against other countries, while Mississippi, Alabama, and the District of Columbia do poorly. The report evaluates 2011 math and science scores from two sources: the National Assessment of Educational Process, which was administered to eighth graders in all 50 states, the District of Columbia, and Department of Defense schools; and from the Trends in International Mathematics and Science Study, which evaluated eighth graders in 38 different countries and 9 "subnational entities" (for example, Quebec and Dubai). Only some states took the TIMMS to create the U.S. score, so for the U.S. states that did not take the TIMSS in 2011, the report used NAEP scores to predict the what the state’s TIMSS scores would have been. 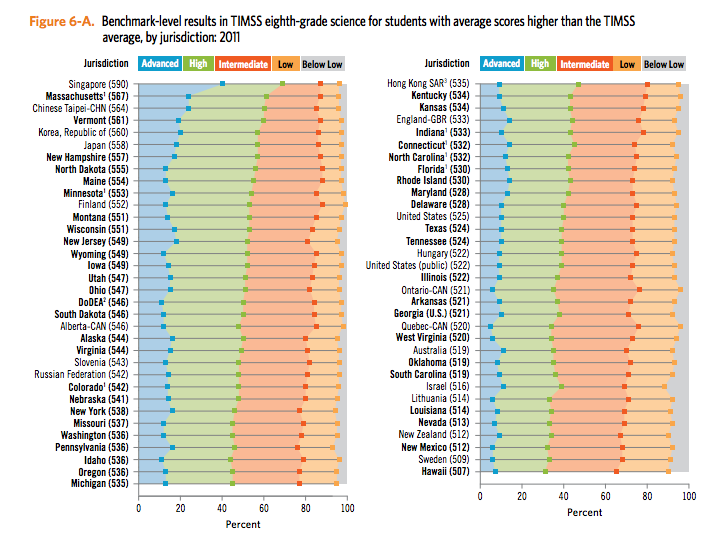 The researchers then used these predictions to rank the states against the other educational systems tested by TIMSS. The average TIMSS score is a 500, and the test uses four benchmarks—low, intermediate, high, and advanced—to describe student scores. 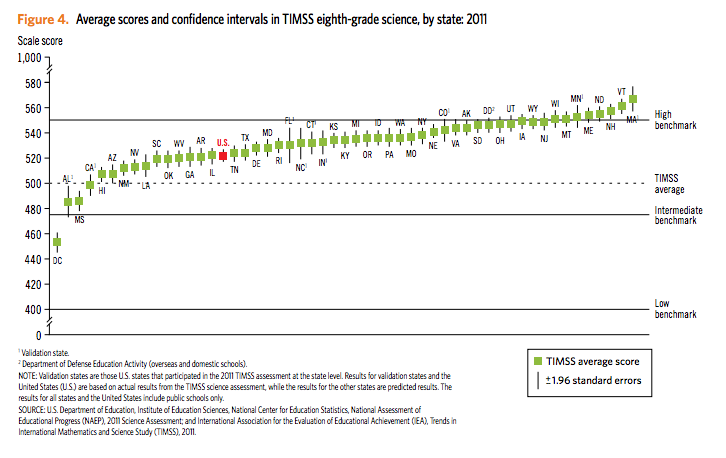 In math, two-thirds of U.S. states scored above the TIMSS average. Massachusetts and Vermont outperformed 43 educational systems, while the District of Columbia ranked above only 14 educational systems. Singapore was the only education system to outrank all U.S. states.